October 9, 2018 (San Diego) - Rob Purdie is an upbeat guy. You can hear it in his unfailingly positive statements, his voice tinged with a Central Valley twang from a life spent in Bakersfield. January 22, 2016 (San Diego’s East County) — Residents in San Diego’s East County have raised fears of spreading Valley Fever spores in their arguments against projects ranging from a sand mine in Lakeside to solar projects in Boulevard and Jacumba. Now a jury in Northern California has shown just how expensive a verdict might be for a government entity or company that ignores such risks. July 13, 2014 (San Diego)--More than 160 scientists, researchers and regional activists met in Phoenix on April 5th to learn about and exchange views on the human and economic costs of Coccidioidomycosis (valley fever). Due to recent national and local media coverage of the valley fever epidemic across the Southwest and formation of a Cocci Congressional Task Force headed by two U.S. House Republicans from California and Arizona-- Kevin McCarthy and David Schweikert--the 58th Annual Meeting of the Cocci Study Group brought together a historic number of attendees. Keynote speaker Steven Holland, MD, deputy director for intramural clinical research at the National Institutes of Health, spoke about human DNA mutations that leave a percentage of people especially vulnerable to valley fever, mycobacterial disease and Job’s Syndrome (immune-mediated disease). Holland concluded that in certain extreme cases of cocci, bone marrow transplants should be considered. He anticipates receiving more referrals of seriously ill cocci patients from Arizona and California physicians. June 23, 2014 (San Diego's East County) - Summer is officially here and with more than half the U.S. currently in drought, there are concerns over the consequences of not only the country's crop yields and wildfires, but also on human health reminds Fire Chief Sam DiGiovanna. March 29, 2013 (San Diego’s East County) – The Centers for Disease Control yesterday issued a press release warning that cases of Valley Fever (Coccidioidomycosis), a fungal respiratory disease, have risen sharply across the southwest including California. Cases rose nearly ten-fold from 2,265 in 1998 to over 22,000 in 2011 in southwestern states. California now accounts for 25% all cases, trailing only Arizona, which has 70% of cases. 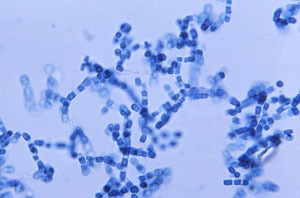 The fungus occurs naturally in dry soils of the southwest and is spread through the air when people inhale the spores. Outbreaks have occurred following wildfires and those in occupations exposed to dust are at higher risk, such as construction workers, archaeologists, farm workers and Border Patrol agents. October 26, 2012 --It's high noon, and the 112–degree summer heat—up from a decade ago—stalks Arizona's Sonoran Desert. By late afternoon, dark clouds threaten, and monsoon winds beat the earth into a mass of swirling sand. Thick walls of surface soil blind drivers on the Interstate. June 13, 2012 (Ocotillo) – Why hasn’t the Bureau of Land Management taken steps to protect Ocotillo area residents from clouds of dust in an area with high rates of childhood asthma and where soil reportedly contains potentially deadly Valley Fever spores? Despite numerous complaints including photos and videos of dust billowing up from construction activities at Pattern Energy’s Ocotillo Express wind energy site, the apparent health hazard continues.